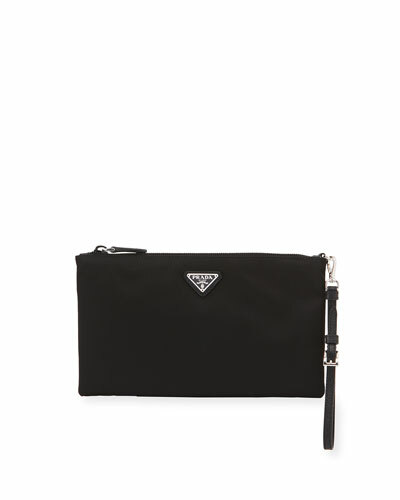 Keep your essentials fashionably in order with Neiman Marcus’ women’s wallets and wristlets. We offer a fine selection of wristlets and wallets for women in gorgeous and contemporary designs. If you’re looking for something convenient to keep your credit cards and other essentials, browse through our selection of women’s card wallets available in an array of colors and designs. Our collection includes chain wallets, mini wallets, and much more from some of the world’s leading fashion designers and brands. Featuring simple and elegant finishes and embossing, our chic pieces lend a sophisticated style to any outfit. Check out our stylish wristlet bags in incredible prints and designs. Trendy and functional, our women’s designer wallets and wristlets are designed to hold everything — from mobile phones to makeup essentials. Shop Neiman Marcus for a great selection of wallets, wristlets, and card cases in a variety of colors, shapes, and sizes. Christian Louboutin holographic shiny patent leather wallet. Removable chain shoulder strap, 22.3" drop. Flap top with spike studs; snap closure. Christian Louboutin holographic shiny patent leather wallet. Removable chain shoulder strap, 22.3" drop. Flap top with spike studs; snap closure. Interior, zip compartment; two bill slots. Six card slots; signature red lining. 3.9"H x 7.5"W x 1.6"D. "Boudoir" is made in Italy. Christian Louboutin grained calfskin wallet with multicolor spikes. Zip-around top with signature red sole pull charm. Interior, two bill and 12 card slots; center zip compartment. Signature red leather and grosgrain lining. 4"H x 7.7"W x 1"D; weighs 9.4 oz. "Panettone" is made in Italy. 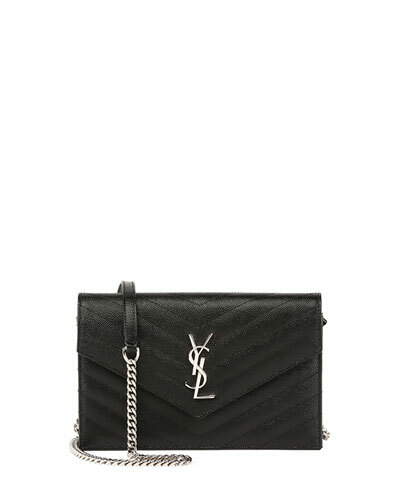 Saint Laurent crackled metallic leather crossbody bag. Chain shoulder strap, 22.1" drop. 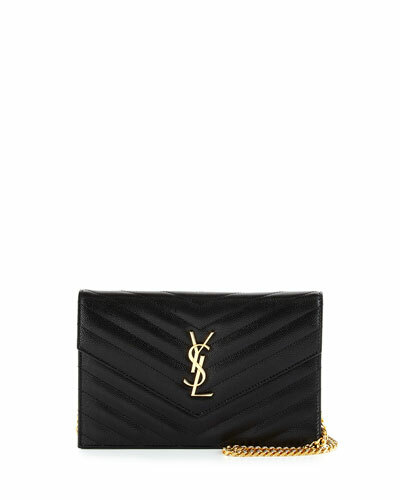 Flap top with YSL logo; snap closure. Interior, fabric lining; one slip pocket. 4.9"H x 7.8"W x 1.9"D. "Kate" is made in Italy.